Mike Konz, NPA president, and Gov. 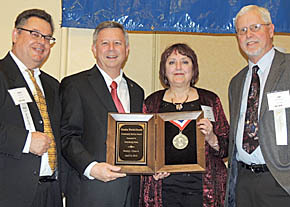 Dave Heineman presented a Community Service award to Julie and Jim Dickerson. Petersburg Press and Albion News were among the winners of top awards in the Nebraska Press Association’s 2012 Better Newspaper Competition. The Petersburg Press was a first place winner in the 2012 Omaha World-Herald Community Service competition for weekly newspapers of up to 859 circulation. The Press received its award for outstanding coverage of the Petersburg Q125 celebration held June 30, July 1 and 2, 2012. Judges noted the community of less than 400 residents attracted crowds of up to 2,000 for its Q125 events, and that the Petersburg Press played a key role in “getting the word out” for this celebration. The Better Newspaper Contest featured more than 4,000 separate entries from 79 weekly and 12 daily newspapers, which were judged by members of the Illinois Press Association. The Petersburg Press earned a total of seven awards in the Better Newspaper Contest, and the Albion News received five awards. Details in the April 17 Albion News & Petersburg Press Print and Electronic Editions.